Lochailort to Oban Bothy 15.4k 826metres. A bright and warm day and was to be the first of many . 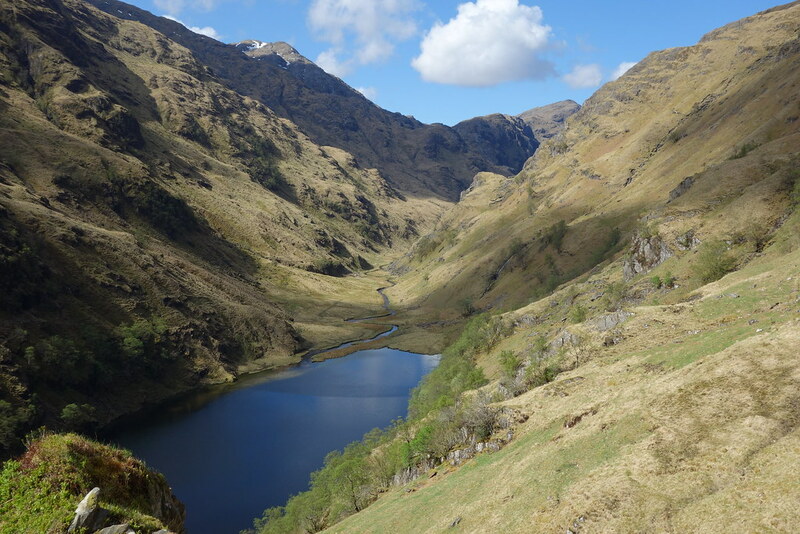 Set away around 9am and off into Glen Pean an area I had never been to and what a revelation. 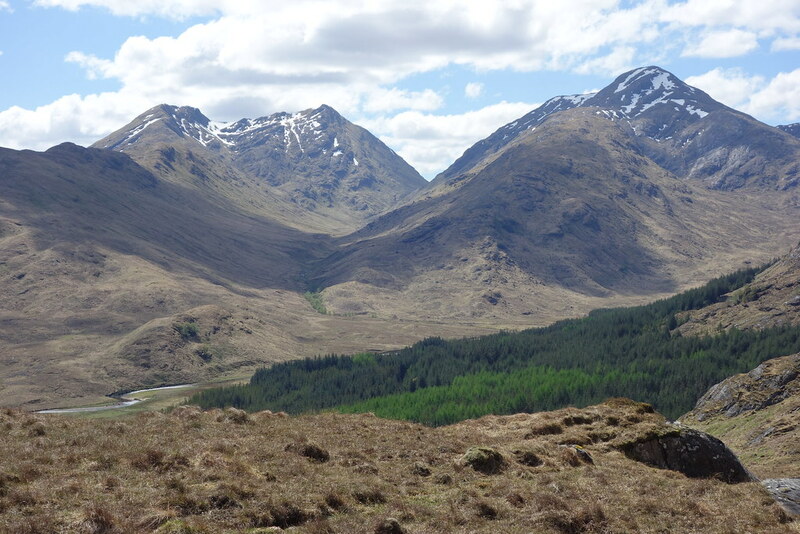 An absolutely beautiful glen with views at every twist and turn. The path was a surprise, I was constantly looking for it and thought I was too high at times before dropping down and up again. 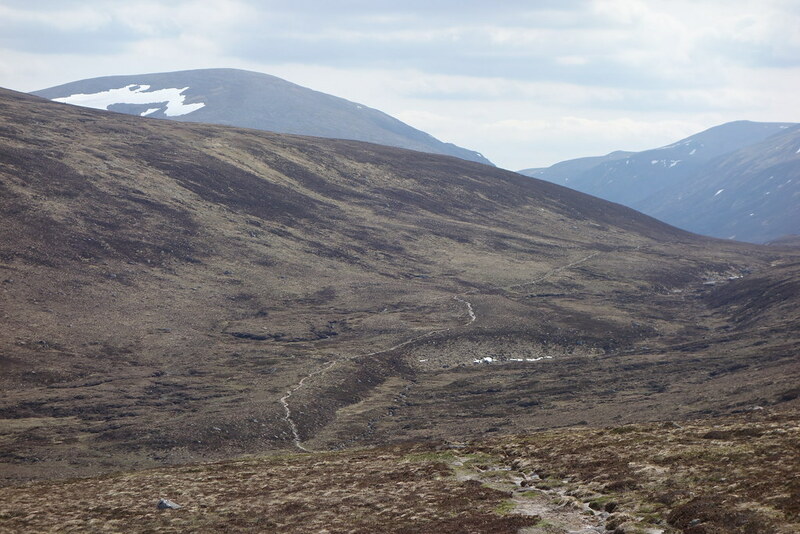 Passed 2 german girls who had walked from Strathan and were going to Sourlies, probably the hard way I remarked. 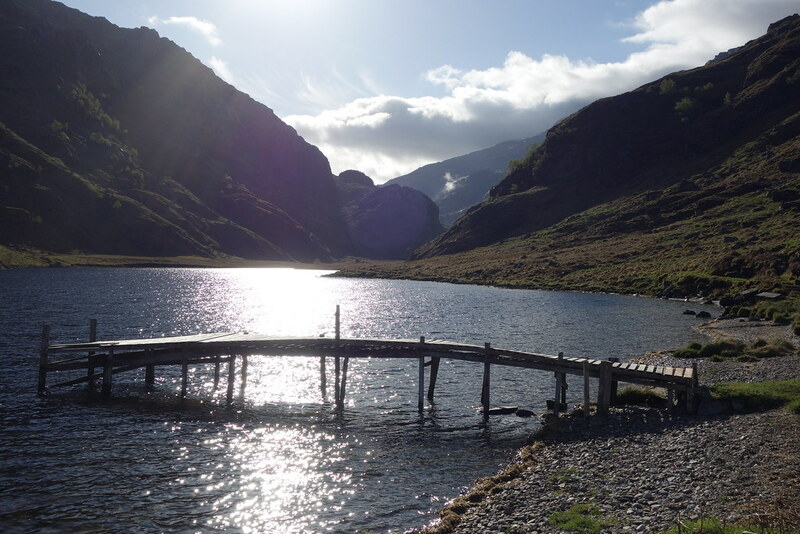 when I got to Lochan Leum an T Sagairt I made the mistake of staying on the north side and it was a laborious time getting past it before the boggy approach to Pean Bothy where I had a break before the short boggy section up to the forest track. From there it was a quick track down to Strathan before the track up by the Dearg Allt. 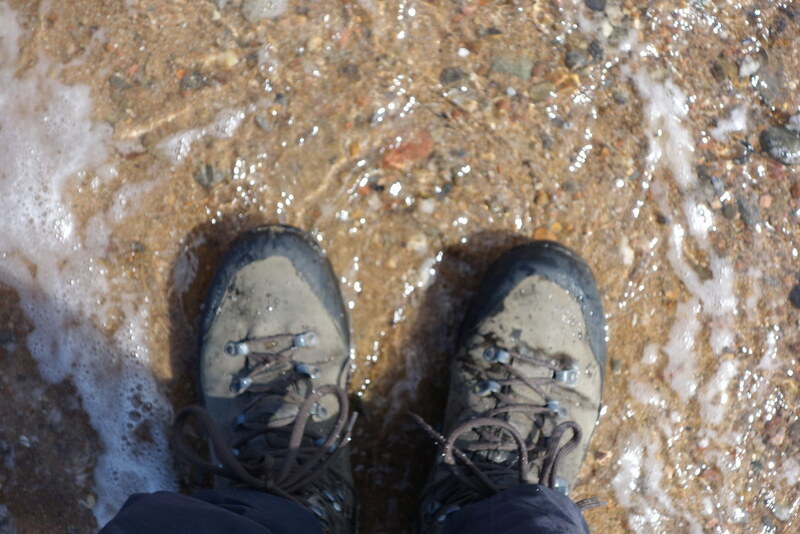 I had initially planned to do the 2 Corbetts either side, but it was hot and opted out. 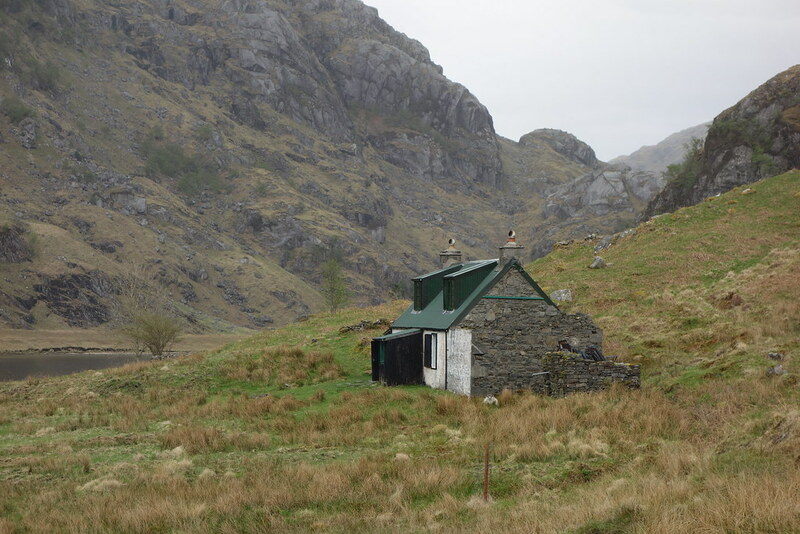 I had planned to use Kinbreak Bothy but on going up the pass I went by 3 lads who asked where the bothy was. 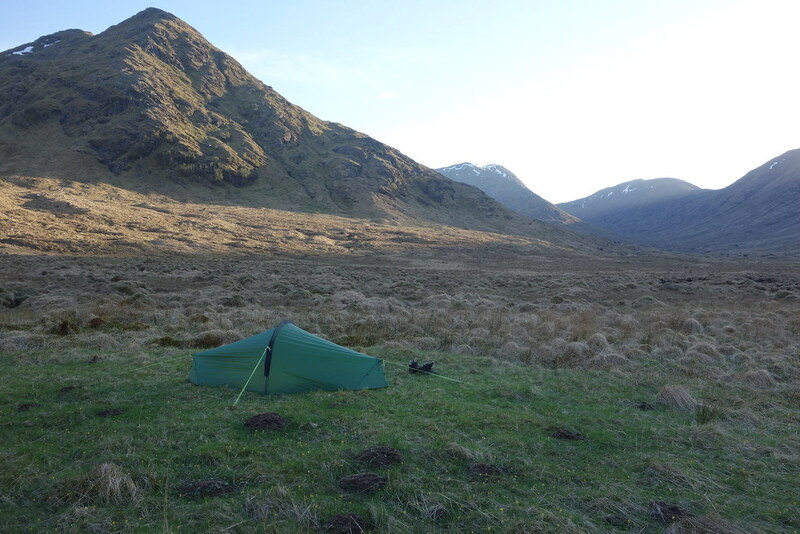 I had been there before and knew it wasnt that big and with it being a warm night opted to camp below the bothy. KInbreak to Poulary 18.1k 938m. A disappointing start to the day, very damp with low cloud and plans to ascend Gairich by its west ridge were abandoned. 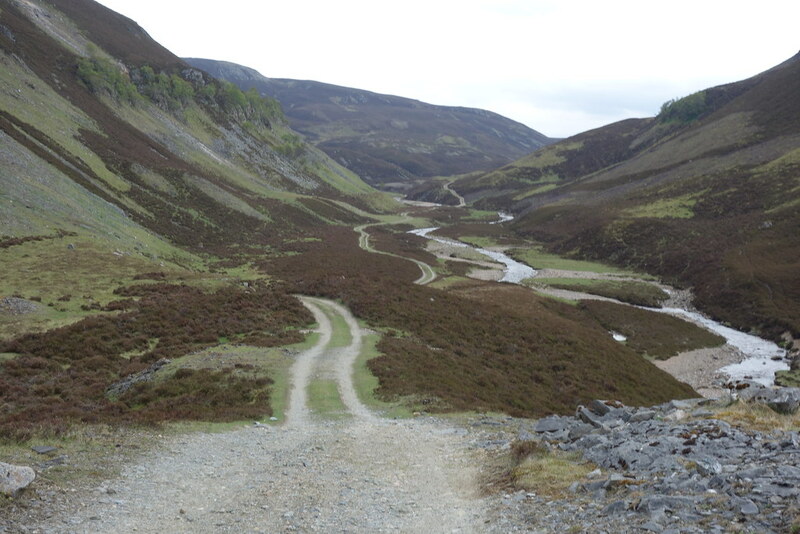 The Kingie was crossed easily and then onto the track heading East out of Glen Kingie. 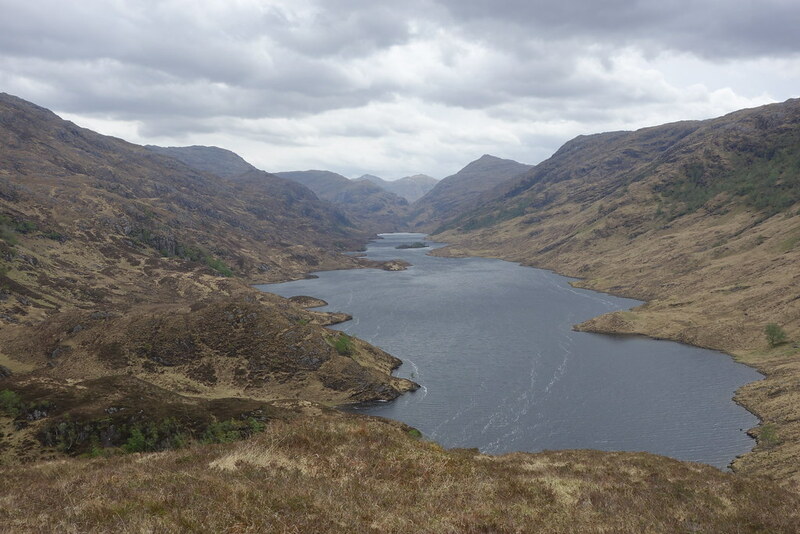 Once out of Kingie I skirted the shoulder of Gairich and then joined the track to the dam of Loch Quioch before road walking down Nr to Poulary where I camped opposite the track over to Claunie. Another short day, shortened by the omission of Gairich. After a healthy breakfast it was off up the GG way and then the canal track for around 3 1/2hrs to Fort Augustus where I did a shop and had a few coffees before climbing the track up through the graveyard and up the Corrieyairack to Blackburn Bothy where I spent the night in the company of 3 other TGO, ers. 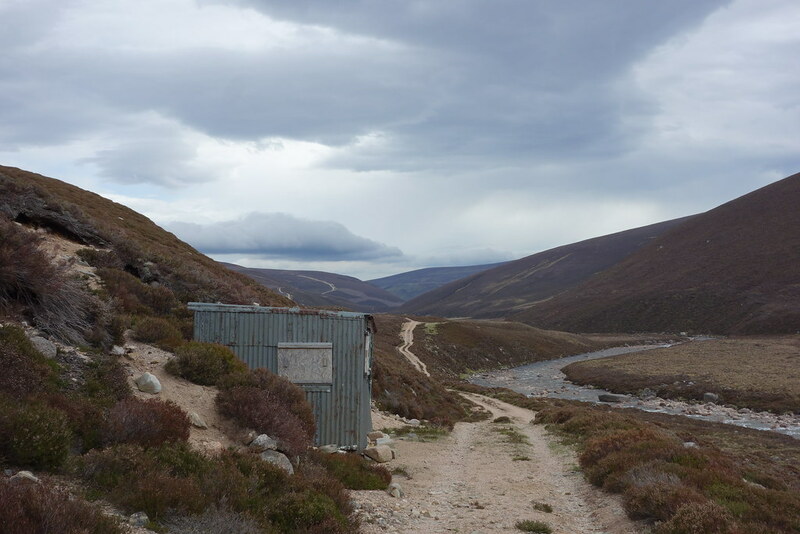 Blackburn Bothy to Garva bridge. 19.2k 619m. Hung around the bothy until 9pm. 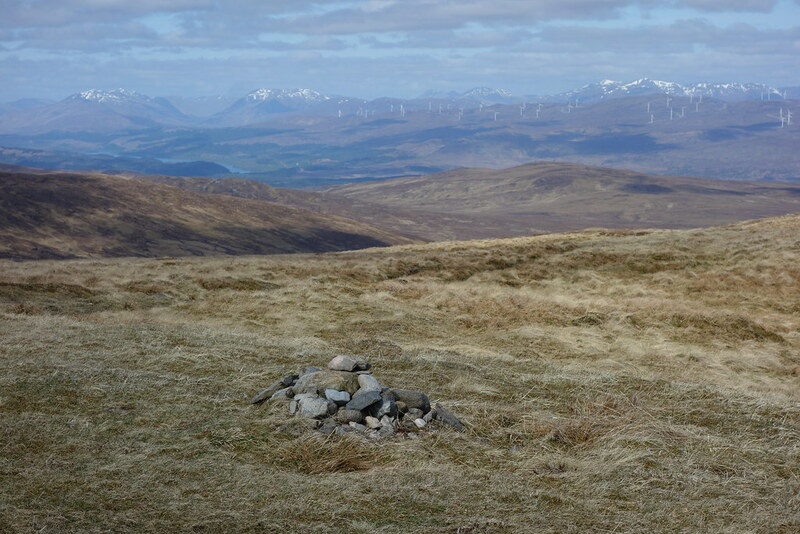 The others had left around 7.30am but i decided on a later start as I found I was covering the ground quickly and doing short days.Climbed the pass and took a breather by the hut at the top of the pass, taking in the scene and identifying the hills over to the west. 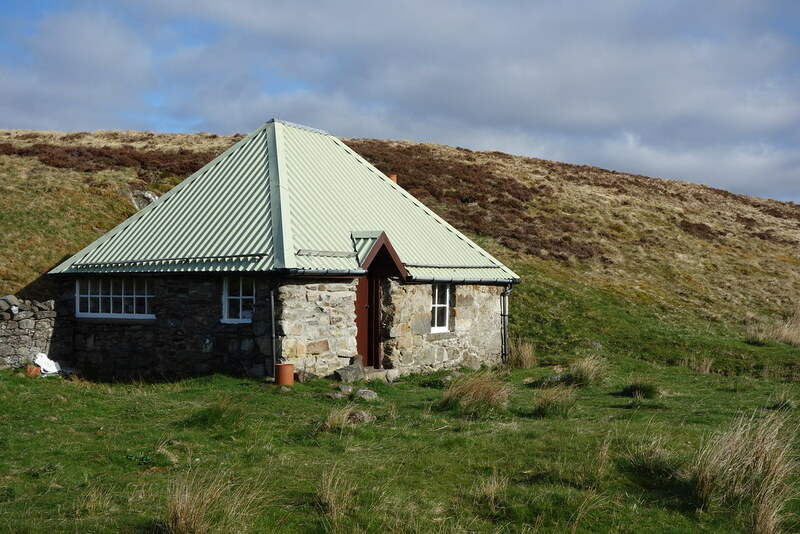 Continued on the pass down to Kinbreak bothy, getting their about 2 after an extended dinner at the bottom of the zig zag paths. 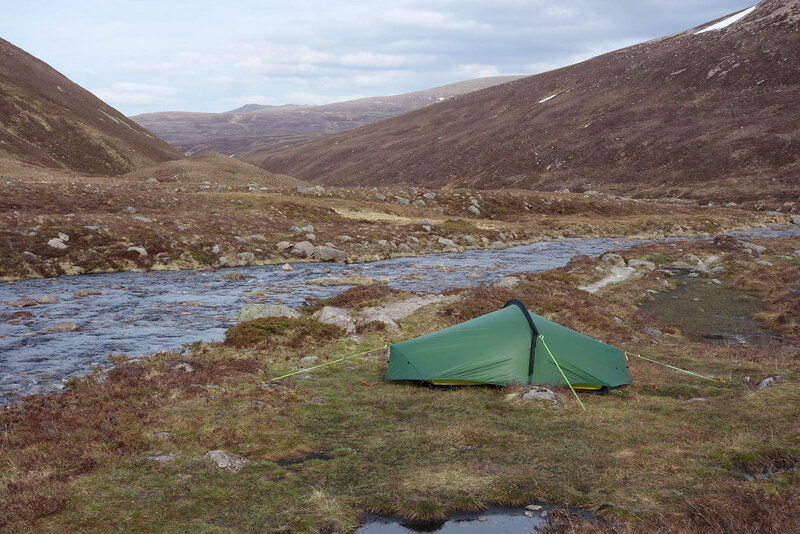 Went into the bothy to get out of the sun and found that several TGO,ers had the same idea. 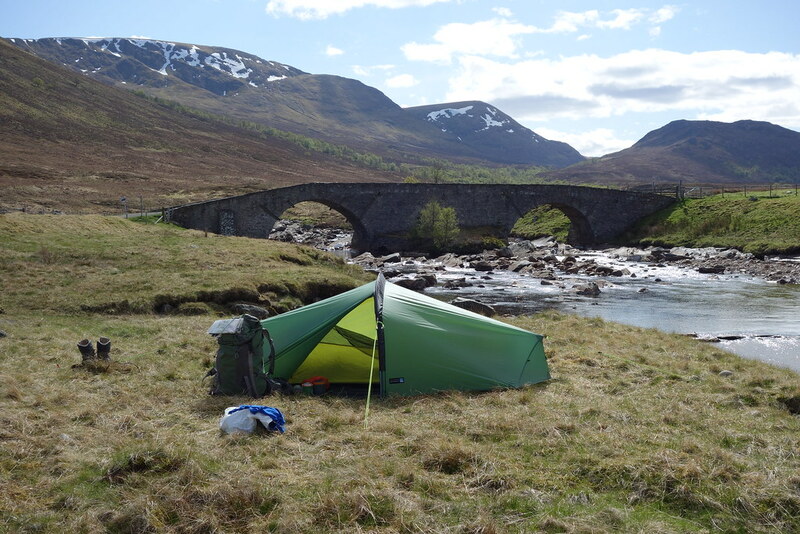 I knew I had only just over an hour easy walking to Garva Bridge ,the overnight stop, so another break in the bothy before setting away around 3.30 and walking the tarmacked road to Garva Bridge for the overnight stop. 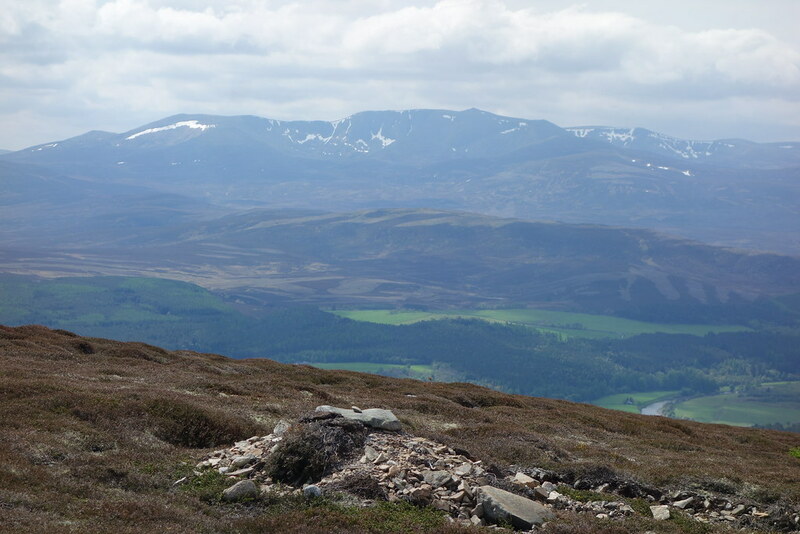 Glen Banchor to Aviemore 28.9k 444m. The longest day for me. I was away at 7.30, intentionally not having any food left as I was getting breakfast in Kingussie, would skip lunch and then do a re shop in Aviemore tonight's destination. 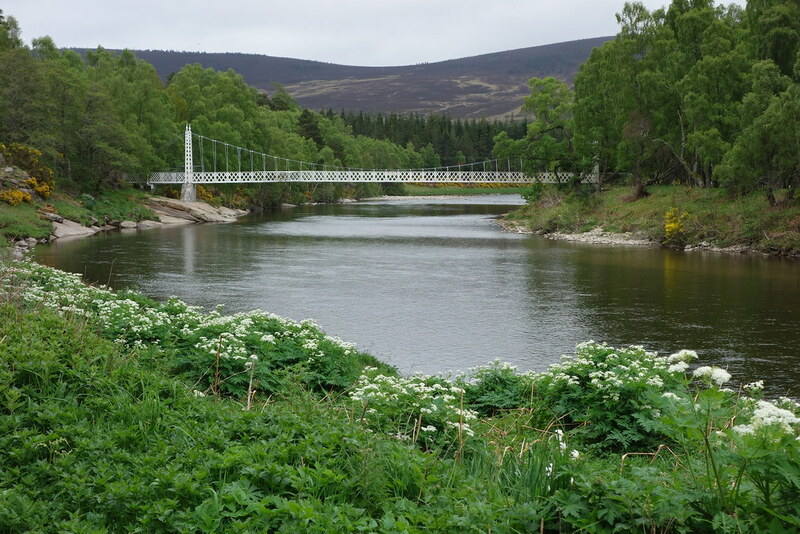 Dropped down into Newtonmore and then followed the cycle track to Kingussie where it was a stop at the first cafe on the right, meeting the same two lads from the previous day. After a breakfast followed the road out to Tromie bridge and then rather than take the various paths took the road out as far as Insh where I opted for the various woodland tracks before the drop down to Loch Insh and then road again to Kincraig where I joined the Speyside way which is easy walking all the way up to Aviemore. Got to the top roundabout where strangely a car containing 5 teenagers passed and one of the rear passengers gave me the finger! Into the bunkhouse around 4pm for a welcome shower, then a restock and a few beers. 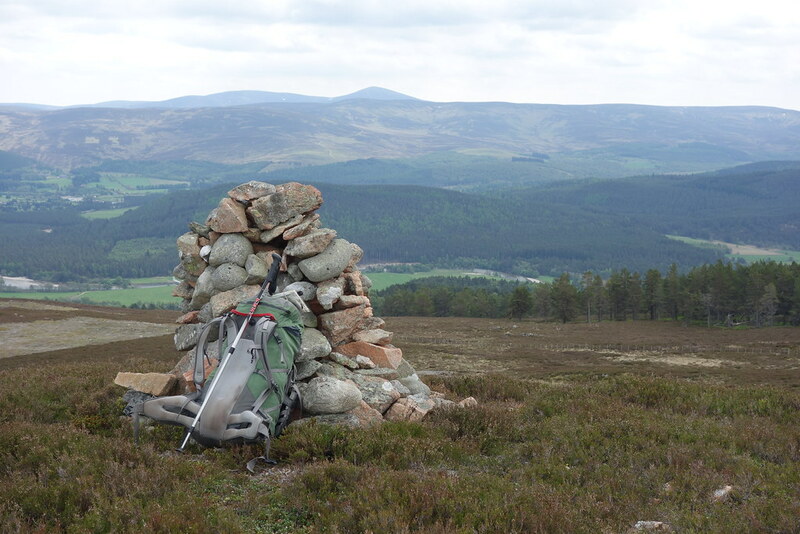 Aviemore to Fords of Avon 23k 700m. Originally the plan had been to go to Faindouran but the would have made the following day shorter so Fords of Avon. Was up early in the bunkhouse so went out after breakfast and returned around 9 to do the packing as there were 3 other room occupants who didn't surface whilst I was packing. 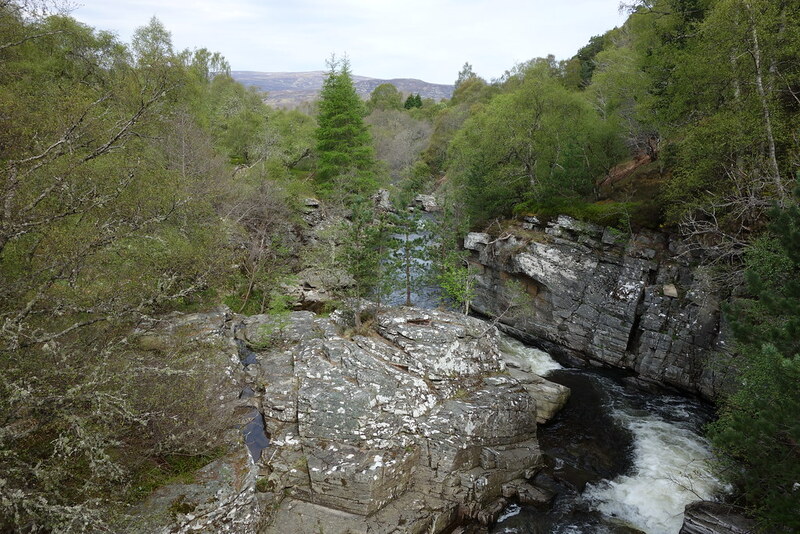 Off up the logging track again and by 11.30 I was at Glenmore having a further coffee before the track up to Ryvoan and then up over the top towards the Fords of Avon. As I was dropping saw 6 mountain bikers pushing bikes coming from the direction of the refuge, who had come from Aviemore as it transpired so only knows how far they had pushed! The lead man approached and asked how long before they could ride on the way back over the shoulder to Ryvoan. The topic turned to the heat as we were talking. Just as the second was arriving I said " Packed too much for this heat" Hearing this the second biker said "got no sympathy for you" Asked why he said " you packed it" I responded "What and you're having to push a bike over these hills! ", prize tool!. The rest of the conversation was a bit strained before I moved on. Got to the refuge and found two occupants already. With the wind getting up I opted for a sheltered spot by the crossing point. 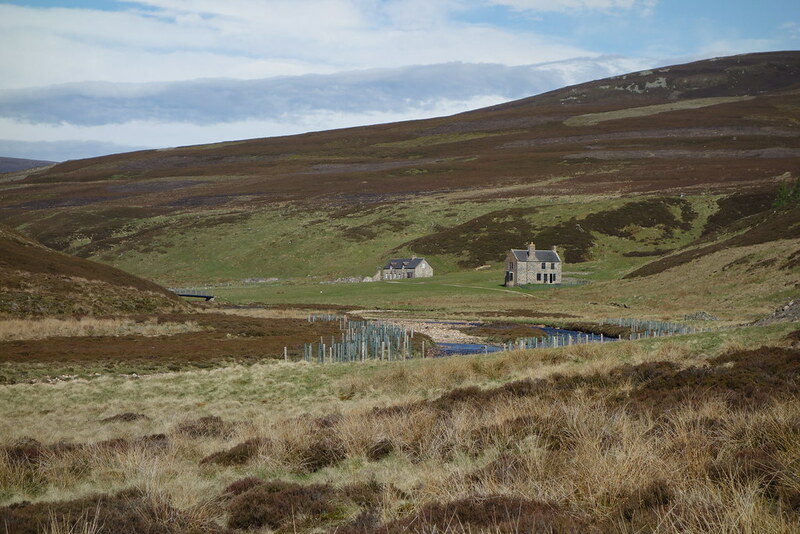 Fords of Avon to Corndavon lodge 25k 628m. Easy start getting onto the path into Glen Avon and then towards Faindouran. 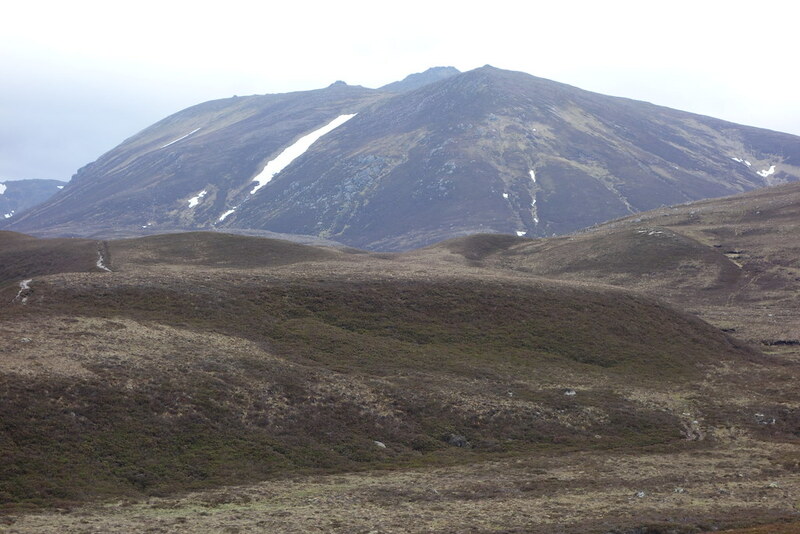 It was a windy day and scuppered my plans of Beinn A Bhuird and Ben Avon. It was an easy walk down the glen taking a break in the ponymans hut before the drop to the Lin Of Avon. 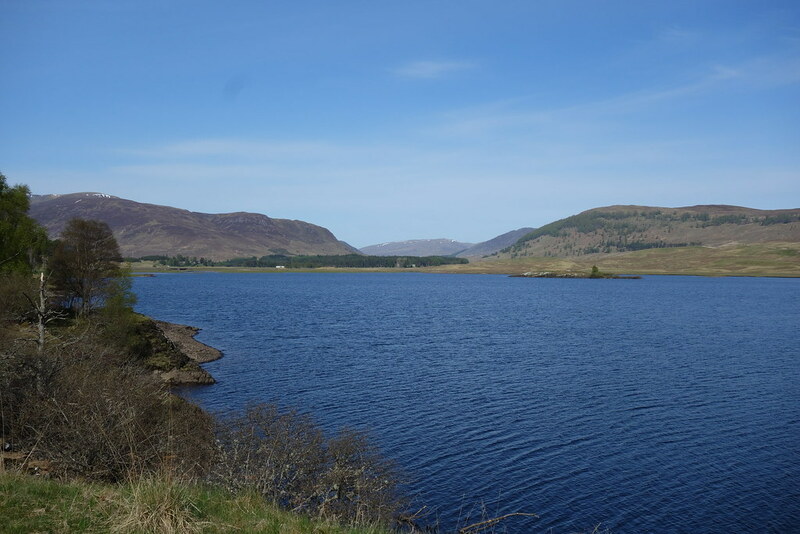 From there it was into the wind which was blowing fiercely down from Loch Builg and was heads down all the way. 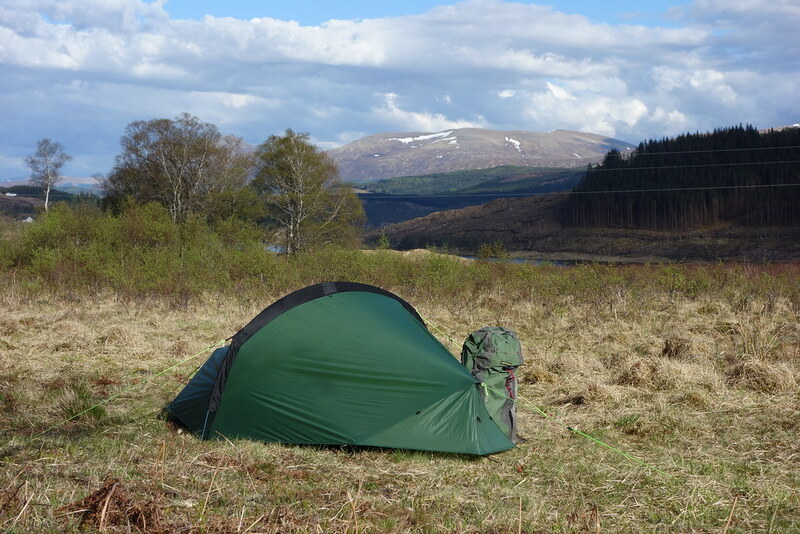 Passed 3 TGO ers who didn't have much crack, maybe because of the wind, and then starte to think about shelter for a later camp as the wind at the time was too strong for a tent in the open. 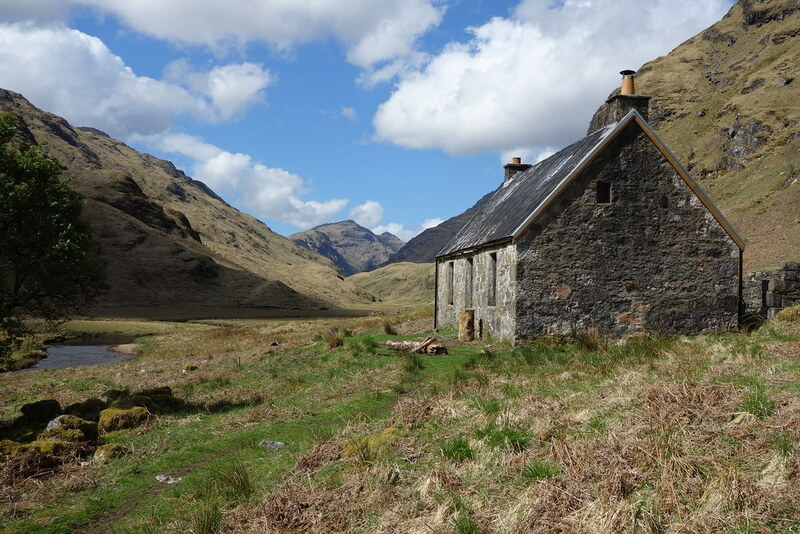 I was aware of old building around Corndavon so I headed off there and got shelter in the lee of the bothy. About 2 hours later one of the group of 3 that I had passed earlier in the day came around the corner of the bothy building, obviously checking for shelter and didn't bother to speak when he walked passed my tent door. So much for the social side of the TGO! 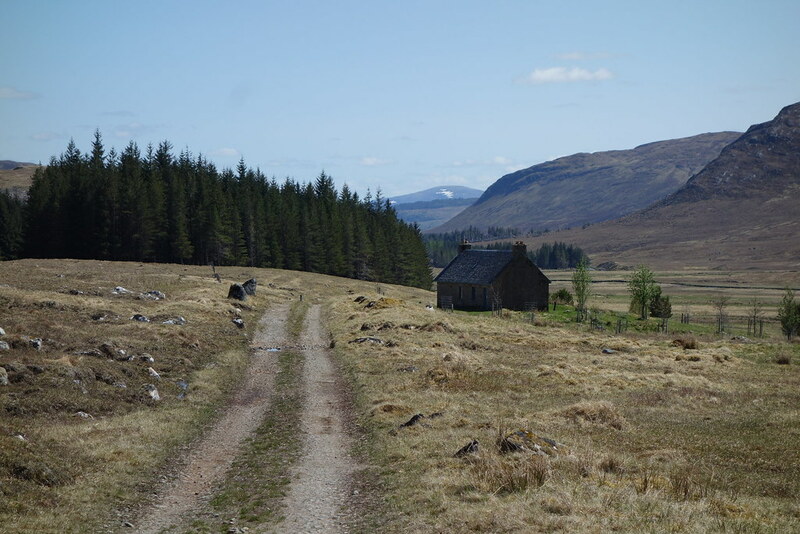 Corndavon Bothy to Ballater 22k 737m. Pleasant walk down the Gairn in the early morning before getting to the road and then across and onto the path to Geallaig hill getting onto the summit in 1 hour. My only hill of the trip as it turned out. 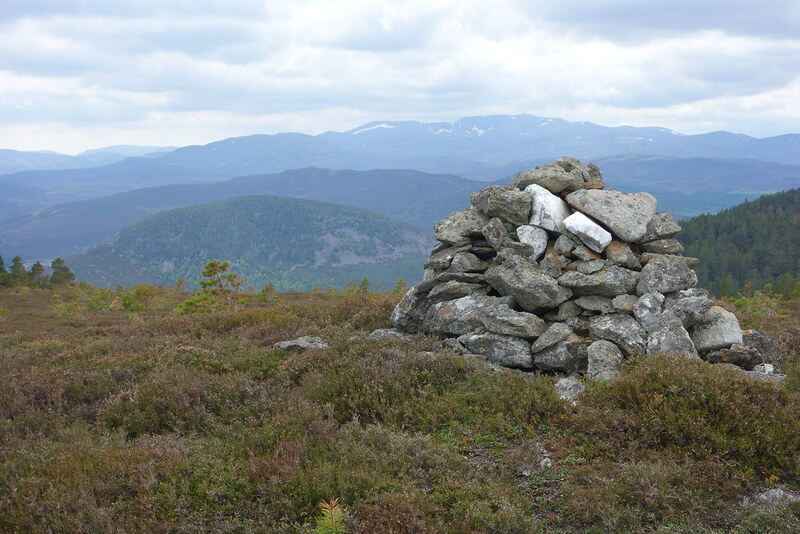 Its a pleasant hill, reminiscent of the Rothbury area of Northumberland, and gives good views of Lochnagar and Mount Keen. 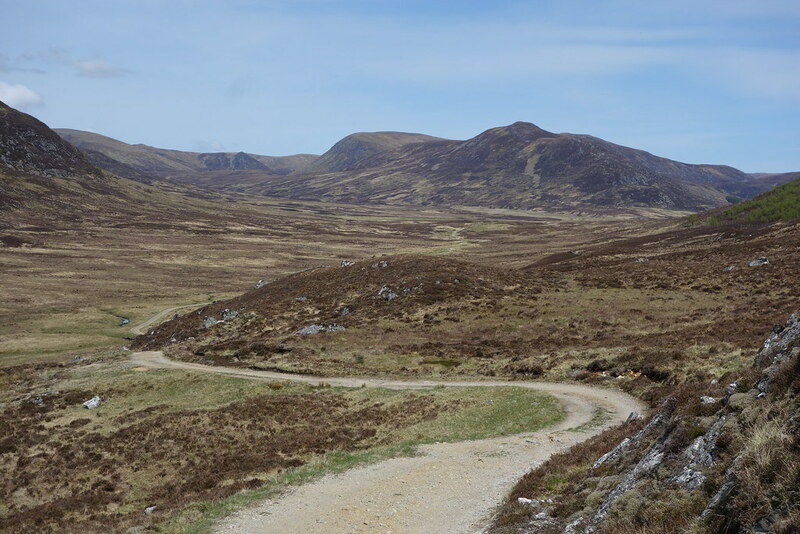 Followed the track to Carn Dearg and then dropped down SE to pick up a path through the woods leading to the road nr Culsh. From there I ignored the riverside path and walked into the town to get a drink before going onto the campsite and then a few beers and restock for the last few days. I had studied the forecast the night before as the next few days were to go over the Fungle road and then over the hills to the Fettereso forest but the forecast was poor instead of saying mist it stated fog. 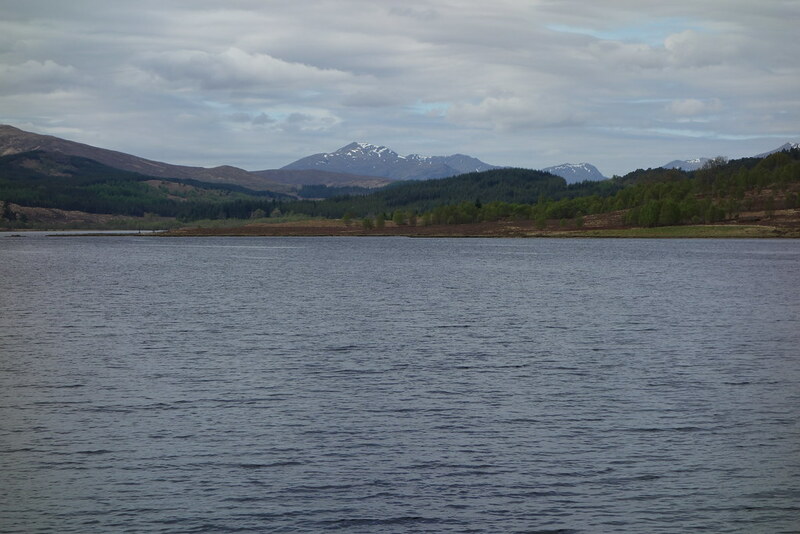 Apart from Mount Keen from Tanar this was first visit walking the area and I was unaware of the coastal fog that can occur around this area. 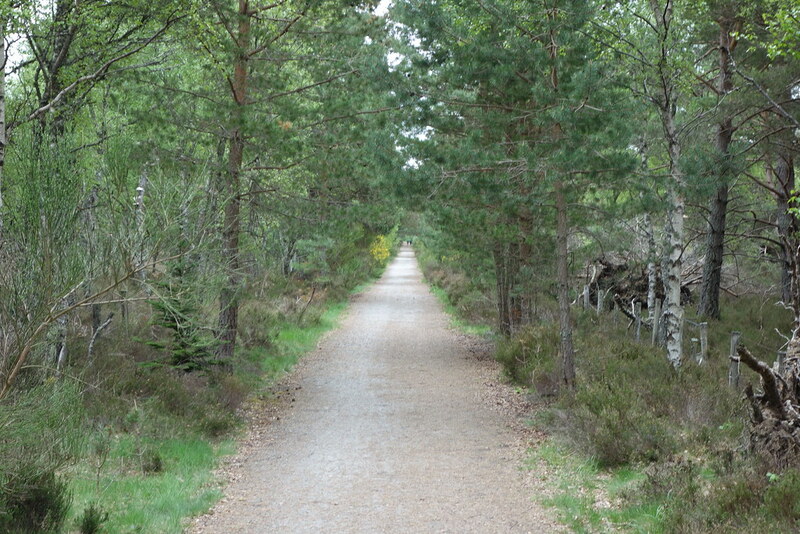 With that forecast in mind I decide to change plan and opt for the Deeside Way. 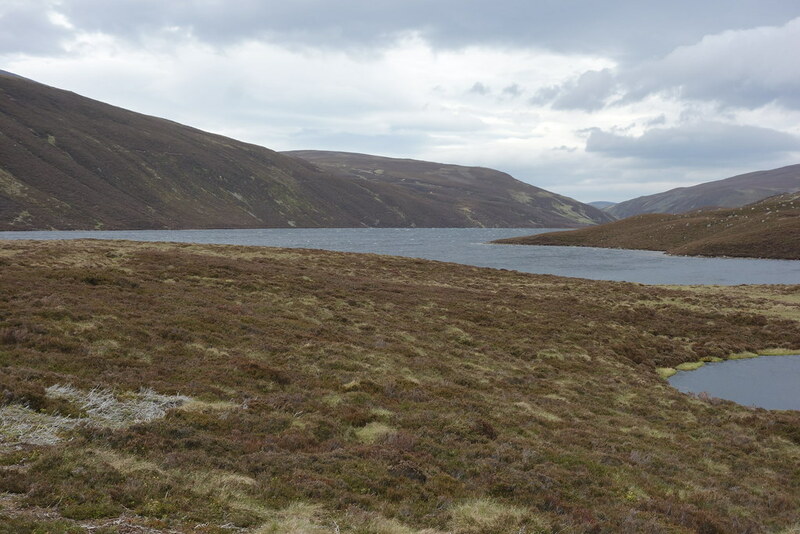 I hadn't studied it but I aware it was it was 40 miles which I could do in 2 1/2 days and was waymaked so I set off on that meeting a TGO, er on the way who I had met in Blackburn Bothy when I gave her a hand after she hadn't met somebody at a pre- arranged point. 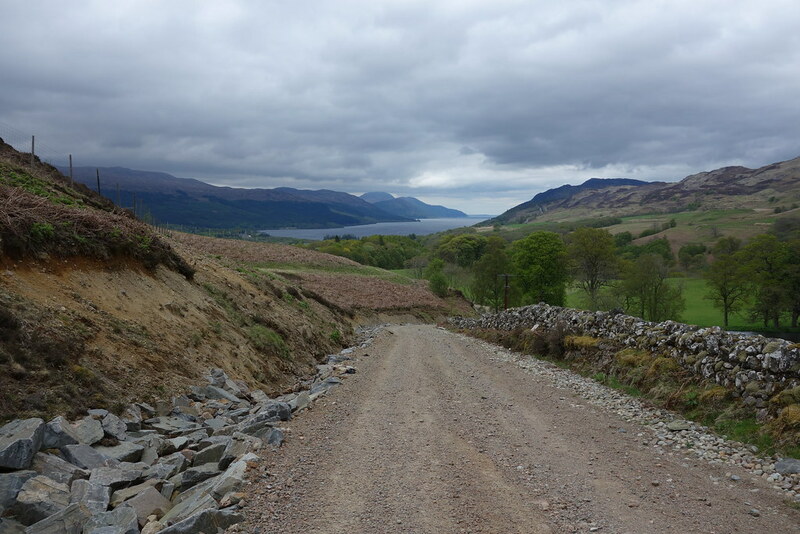 They said TGO control stated the Deeside way could take 4 days which I doubted. 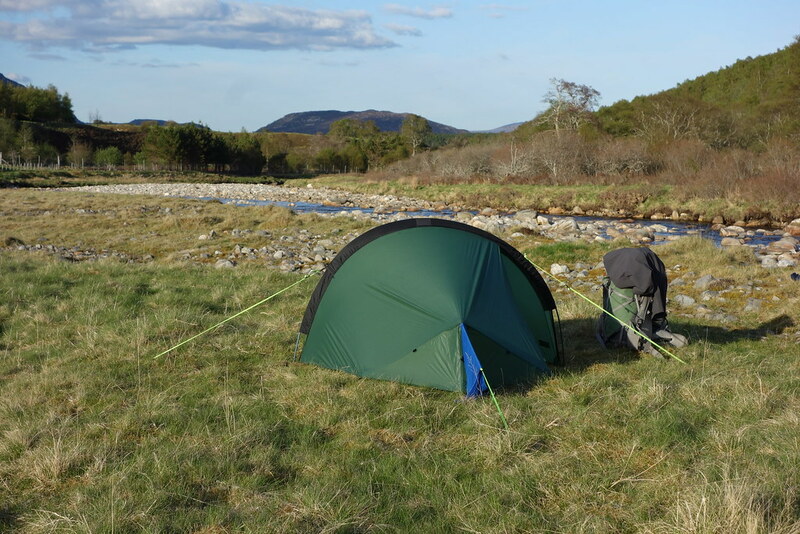 I had no idea of where to camp overnight so I just kept on walking for about 17 miles until I came to a fishing hut on the riverbank just outside Kincardine O Neil and camped beside that around 6pm. 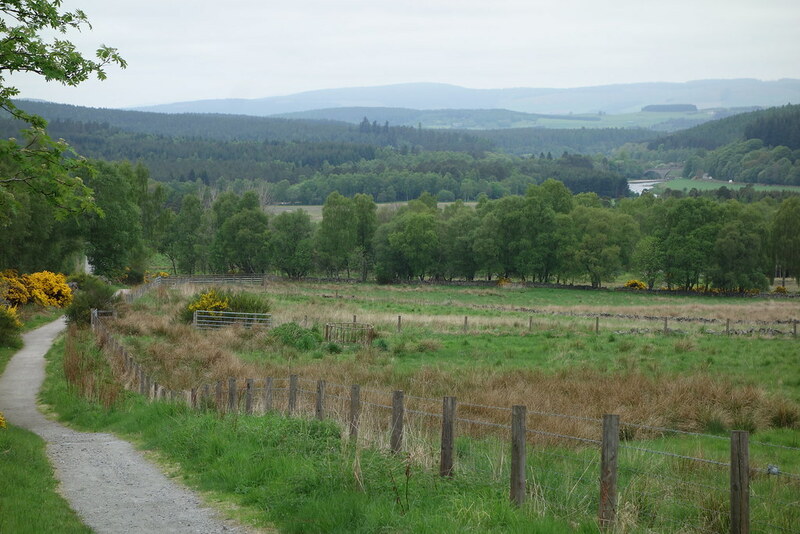 Kincardine O Neill to Drumoak 26.6k 431m. Fab day on the Lowther Donalds. Pub: Any at the end of a walk! 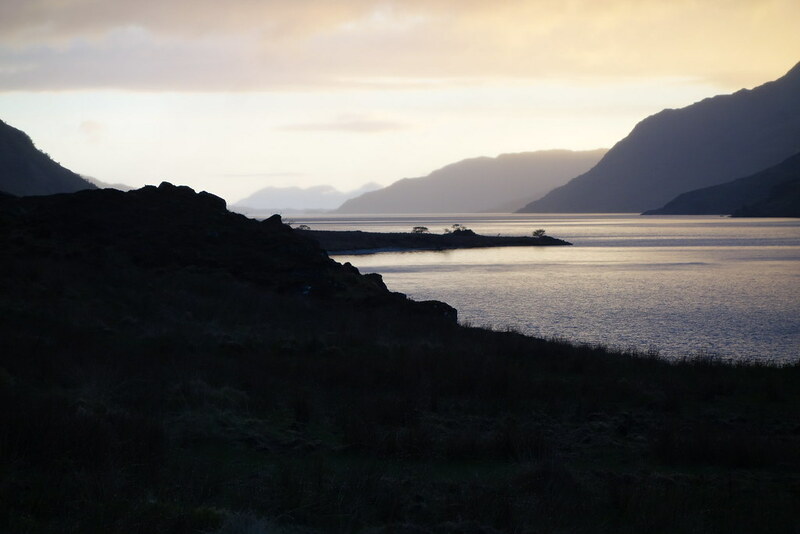 Ideal day out: Backpacking anywhere in the Highlands.